Roasting cauliflower is my favorite way to enjoy this cruciferous veggie. This combo might be my favorite yet. The spices caramelize and roasting at a high heat allows the cauliflower to turn perfectly brown. The lemon lends just the right amount of tang. This Greek yogurt dip on the side is the perfect accompaniment as it’s creamy, protein packed and kid approved. The kids gave this two thumbs up at February’s taste test! Lay cauliflower out on baking sheet. Drizzle with olive oil, lemon juice, salt, paprika, black pepper, garlic powder and onion powder. Toss to evenly coat the cauliflower. Roast in a preheated oven for 15-18 minutes until golden brown. Meanwhile make the yogurt dip by combining yogurt, kosher salt, garlic powder, dried basil, onion powder and chives. Mix to combine. 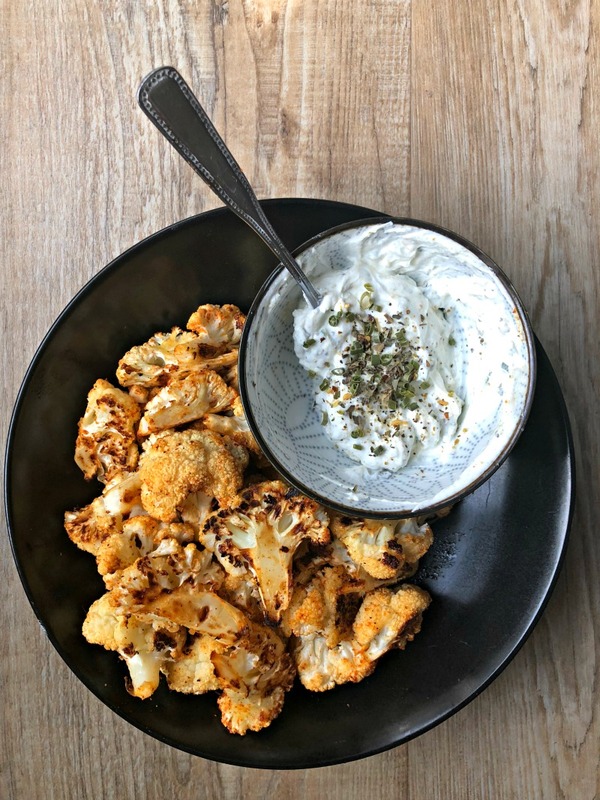 Serve roasted cauliflower with yogurt dipping sauce on the side.